Flu is a respiratory illness that is caused by a virus named influenza. This disorder falls in the category of infectious diseases and is highly contagious. This means that people have a high risk of transmission from one person to another. This article will give you some tips as to what foods can protect you from catching flu. Before getting into the details, you must be aware of the fact that the flu is a viral disease. This means that medicines may not help in fighting this disease. However, there are several natural remedies that may prevent the development of this illness. What to Eat To Protect Yourself from the Flu? Chicken soup is always the best option for those suffering from flu. This is because the chicken soup is nourishing and hydrating. It is also believed that it has some kind of anti-inflammatory effects on the body which help in curing flu. Chicken soup is a protein rich diet that is known to have healing effects. There are also other types of soups, such as vegetable soup, which can also be very helpful in this condition because of the healing ability of the ingredients of the soup. Having a glass of low sodium vegetable juice is a pretty good idea. It has an extraordinary immune boosting anti-oxidants that enhance that healing ability of the body. Its anti-oxidants also keep you away from different types of cancers that can be fatal. Caffeine-free hot tea has proven to be very helpful for people suffering from flu. Black tea, Oolong tea, and green tea offer disease fighting antioxidants. The steam vaporizing off of the hot tea is helpful when the respiratory airways of a person are congested. Inhaling steam is way better than using nasal decongestants. It does not mean that nasal decongestants are not useful. They are undoubtedly helpful but, caffeine-free hot tea is a natural remedy which is preferred by most of the people. 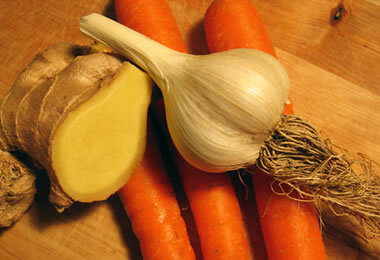 Ginger is a natural remedy for the treatment of gastrointestinal symptoms that are caused by the flu. It is found to be very helpful in soothing symptoms like nausea, vomiting, etc. The natural anti-inflammatory effect of ginger helps in aiding sore throat, tonsillitis, and rhinitis which are the most common complications of sore throat. Ginger actually reduces the quantity of inflammatory mediators which are responsible for the inflammation of the throat and surrounding area. Decrease in the number of inflammatory mediators reduces the inflammation. Raw garlic is a pungent flu fighter. A Naturopathic doctor, Bryan Rade, says that garlic consists of Allicin and Allion which have powerful antiviral effects. The best thing about this natural herb is that you can take it anytime, even when you are healthy. If you feel like you are getting trapped by common cold or flu, you can simply consume a small portion of garlic which will help you stay healthy and away from viral diseases. Many people have problems chewing this pungent herb. You can simply swallow a little portion of ginger without chewing it. It will have the same effect as the ginger portion that is chewed rather than swallowed. You will be surprised to know that garlic is outstandingly helpful for the heart patients. This is because it has the ability to decrease the total cholesterol level, hypertension, and triglycerides in blood. It is also found to be anti-inflammatory because of which it may help in the prevention of sore throat and congestion. Banana, rice, applesauce, and toast are collectively known as BRAT diet. This type of diet should be taken by the patients who are suffering from flu, especially the patients who have developed the symptoms of digestive system along with the symptoms of flu. The flu is usually known to involve the digestive system because of which many patients experience nausea, vomiting, and rarely diarrhea. Taking BRAT diet does not put too much pressure on the patient’s digestive tract which makes it easy for the patient to digest this food. Look for lactose free drinks that are low in sugar. These drinks are usually helpful when you regain your appetite. It is not a good idea to start eating right after the recovery from the disease. In the recovery period, your body needs soft foods that are easy on your stomach. Vegetable juices, fruit juices, and sports drinks are better to drink than milk. Remember not to take dairy products when you are suffering from flu and congestion. These products tend to enhance mucus production which is known to exaggerate congestion. If you are suffering from flu, keep the following points in mind. These will help you in quick recovery. I use ginger to help alleviate my cold and flu.